For the second day in a row, a torrent of water on Sunday flowed over the Anderson Reservoir spillway, marking a phenomenon that hadn't happened for 11 years until this weekend. That phenomenon has created danger. Rick Boone reports. For the second day in a row, a torrent of water on Sunday flowed over the Anderson Reservoir spillway, marking a phenomenon that hadn't happened for 11 years until this weekend. The Morgan Hill reservoir hovered around 101.4 percent of its maximum capacity as of Sunday afternoon, but that number could rise as an impending storm barrels toward the Bay Area. 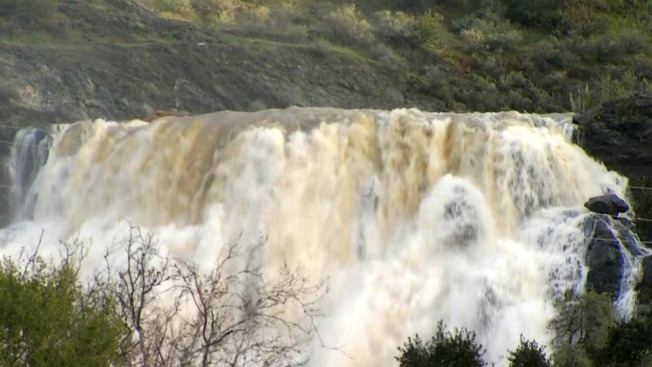 Once water started spillover over the dam's spillway Saturday afternoon, people living along Coyote Creek were reminded to be on the lookout for flooding. Homeowners near the dam aren’t at high risk for flooding, but downstream in San Jose, there are a few low-lying vulnerable spots. One is the Golden Wheel Mobile Home Park in the Berryessa neighborhood, according to Santa Clara Valley Water District spokesman Marty Grimes. San Jose resident Ken Tang lives in the Berryessa neighborhood. He is among those concerned about the worst case scenario. "(The creek) is higher than I've seen it in the last 5 years," he said. "It might be the highest I've seen it in the whole nine years I've lived in my house here." Aside from flooding concerns, officials are also worried about earthquake activity. The Anderson Reservoir sits in an earthquake zone and the dam, which was built in 1950 when seismic standards were not as strict as they are today, could be damaged by a 7.25 magnitude or greater earthquake, according to Grimes. Before any seismic retrofitting projects are accomplished, the water district must do what they can to keep the reservoir's water level at or below 68 percent capacity. Officials have been releasing about 400 cubic feet of water per second for the past week, but that rate is not been fast enough to keep up with relentless rain and runoff. Meanwhile, Grimes estimated that is could take anywhere from four to nine weeks to lower the water level to the point where the dam could withstand a powerful earthquake. Officials have been developing a plan to retrofit the dam since 2009, but the soonest the water district would commence construction would be in 2020. The $400 million seismic retrofit project, which would partially be paid for by a parcel tax and increased water rates spread out over 30 years, would likely take at least four years to complete, according to Grimes.